Robot Professional Wrestling Match, `Dekinnoka!10.5` took place at Robospot in Akihabara, Tokyo on Mar 11, 2012 for the UK Gadget Show. ` Dekinnoka` also took place in the RoboGames 2012 on Apr 20-22, 2012 and the main character robot, Ryuketsu Kamen got the Gold medal in the Humanoid Freestyle Kit Class. `Dekinnoka!` in Japanese, means `Can you do it?`. 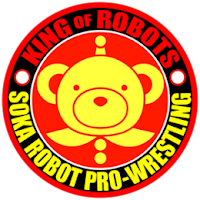 As Omata-san, producer of `Dekinnoka` has been loving real professional wrestling, the 1st Robot Professional Wrestling in Soka on Nov. 3rd, 2008 was planned and held by him. He explained the 'Robot Professional Wrestling' was not 'Wrestling' but 'Fighting Arts'. The purpose of `Dekinnoka!` was not only robot fight but also to inform pleasure of robot. Details of the UK Gadget Show visiting Japan, deciding to build a humanoid robot, and getting in the ring with Robot Pro-Wrestling Robots were described in the ROBOSAVVEY as Robosavvy helped making Gadget Show's Japan robotics episode. Ninja robot wrestler fought with Ryuketsu Kamen, Yukikaze and the Champion Great Saaga. Shibata-san helped Jason-san adjust Bulldog Ninja for the best balance and performance. Ryuketsu Kamen fought with Garoo as the demonstration of the Humanoid Freestyle Kit Class and got the Gold medal. 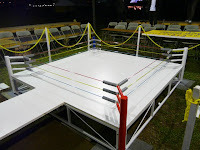 Amino-san took a video of Robot Pro-Wrestling `Dekinnoka!` fight, Ryuketsu Kamen vs Garoo by his Aerial photography from Quadcopter. Omata-san carried out 10 times `Dekinnoka! as 1, 2, 2.5, 3, 3.5, 4, 5, 6, 7, 8 , 9 and 10 during 3 years. `Deknnoka!` has been also supported by the members of Kanto-Training-Group. Reports of `Dekinnoka!`, `Dekinnoka!2`, `Dekinnoka!3`, `Dekinnoka!5`, 'Dekinnoka!6' , Dekinnoka!7' , `Dekinnoka!8` , `Dekinnoka!9` and `Dekinnoka!10` have been uploaded in this blog. Videos were also uploaded to the 'Dekinnoka Official Site` by Omata-san. You can watch the details of the Robot Professional Wrestling videos by clicking each 10 poster of `Deinnoka! 1, 2, 2.5, 3, 3.5, 4, 5, 6, 7, 8 , 9` and 10.